On this day in 1970 the MiG-23 had its first flight. Known to NATO by the reporting name “Flogger”, it is considered to be a third generation fighter along with other Soviet fighters such as the MiG-25. The Flogger was the first attempt by the Soviet Union to design a “look-down/shoot-down” radar, allowing it to detect and track aircraft below the horizon. It was also the first Soviet aircraft to be armed with beyond visual range missiles and the first MiG to have side intakes rather than the front intake seen on prior MiGs (such as the MiG-19 and MiG-21). 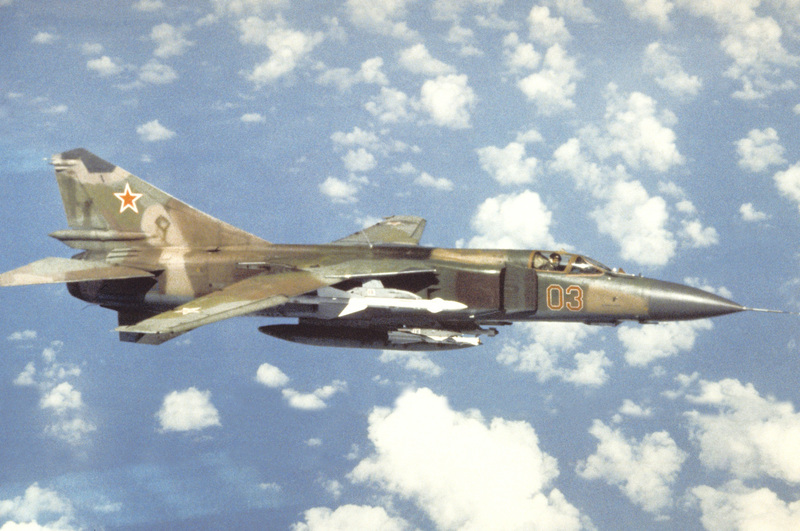 The design of the MiG-23 was also the basis for the MiG-27, a ground-attack aircraft. Between 1967 and 1985, 5,047 MiG-23’s were produced and used by many countries, primarily the Soviet Union, the Syrian Air Force, Libyan Air Force, Yemen Air Force and the Bulgarian Air Force. It is currently in use by Angola, Nambia, Ethiopia, Libya, Cote D’Ivoire, Syria, Yemen, Cuba, Vietnam, North Korea and Sri Lanka.